Most Oklahomans look forward to fall for football games, milder weather, and fall foliage. But one of the very best ways to get into the spirit of the season is to pick up a plump, orange pumpkin! Across Oklahoma, from local farms to small patches, you’ll find places to pick up a perfectly festive pumpkin. Here are the 10 best pumpkin patches in the state. P Bar Farms opens each year in mid-September. You can pick the perfect pumpkin out of its patch, but you’ll want to plan to spend a couple of hours going through the corn maze, enjoying a hayride, taking a train ride, petting the animals, and playing in the corn pit. Take your camera to get a picture of the sunflower field. Woodbine Farms opens in October. They have a pumpkin patch, but there’s much more to this smoke-free farm. Enjoy a hayride, play in the sand pile or walk across a tight rope. On the weekends, you can roast smores under the oak trees. Come as group or just bring the family. The season at Reding Farm opens in late September. It boasts the largest corn maize in Oklahoma, plus many more activities including bonfires, a cow train and corn cannon. 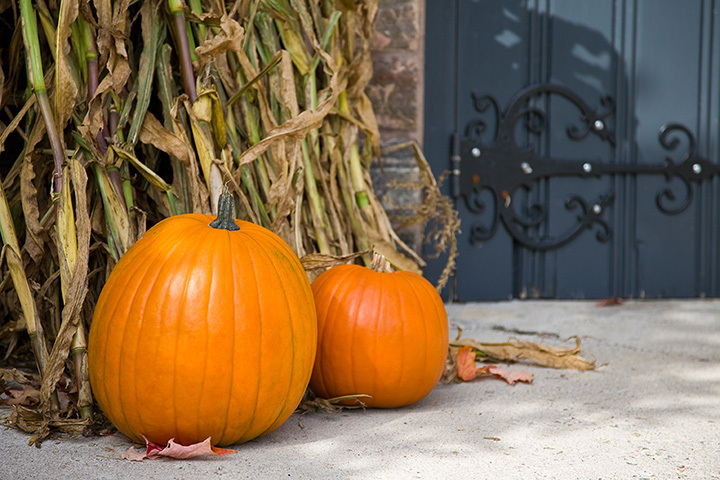 Choose a pumpkin from the pumpkin patch and take holiday pictures to remember the day. This pumpkin patch offers a season pass to its activities with a free pumpkin included. They feature hay rides, a petting zoo, hay maze and pony rides. You can also choose your own pumpkin without purchasing a season pass. Chester’s is an autumn standard in the Oklahoma City area. They’ve been around for nearly 20 years and keep adding fun features to their farm. Every guest gets a pumpkin from the pumpkin patch with paid admission. It’s a great way to spend the day in the country. The season at Wild Things Farm generally opens in late September. They’re only open Saturdays and Sundays, but they have over 90 acres of fun, including a corn maze and pumpkin patch. In October, the corn maze turns into a flashlight maze at night, so you might want to plan an evening trip if that’s your jam. You’ll find pie pumpkins and jack-o’-lanterns at Annabelle’s, plus more than 35 activities. The farm usually opens at the end of September. You’ll want to check their calendar for special events, such as grandparent’s weekend (grandparents get in free with paid child admission) or heroes weekend, in which police, fire fighters and first responders get in free with ID card. This farm is an Oklahoma Redbud Award Recipient, earning high rankings for tourism in the state. Its season opens at the start of October, and it’s only open on the weekends for families. In addition to the pumpkin patch, you’ll find dozens of activities to keep the kids busy and enjoying nature. Guests get a free pumpkin with admission at this pumpkin patch just east of Edmond, OK. The season opens in mid-September. You’ll be able to enjoy fresh country air and a little taste of what it was like living on the farm when you visit. Kids can pet bunnies, play on tire swings and roast hot dogs and marshmallows over the fire pit. This agriculture adventure is one of the top autumn attractions in southern Oklahoma. Guests get a free pie pumpkin with admission. Make sure to show your military ID for a discount. They have lots of activities for kids of all ages. Bring a camera and get one of the farm animals to pose with you for fun memories of the day.